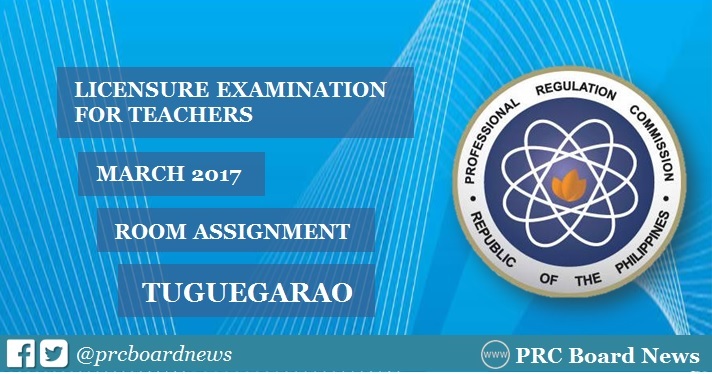 The Professional Regulation Commission (PRC) Tuguegarao regional office has released list of room assignment for examinees of March 26, 2017 Licensure Exam for Teachers (LET) in Tuguegarao City, Cagayan Province. Examinations for Elementary level will be conducted in Linao Elementary School, Tuguegarao North-East Central School and Carig Sur Elementary School. For Secondary level, LET will be administered in Tuguegarao East Central School and Tuguegarao West Central School, Maila Rosario College and Tuguegarao North Central School. March 2017 LET will be held simultaneously in the cities of Baguio, Cagayan de Oro, Catarman, Lucena, Northern Puerto Princesa, Samar, San Jose (Occidental Mindoro), Cebu, Davao, Iloilo, Legaspi, Manila, Rosales, Tacloban and Pagadian.